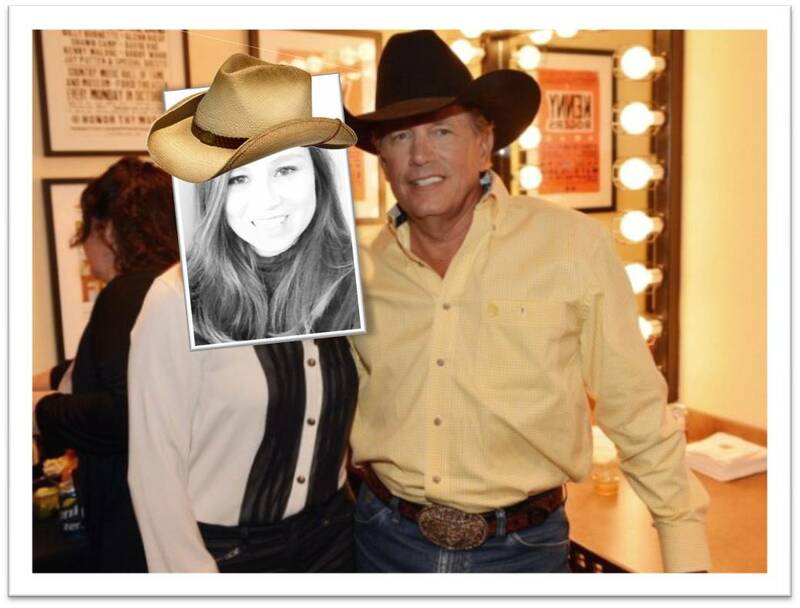 My imaginary fan meet up with George Strait. Hope Martina doesn’t mind that I inserted my face over hers in this photo! I don’t think anyone would classify me as a country music fan…although there were a few years in the mid-nineties where I “walked the line.” Okay, I’ll confess—I had a hat at the time, but it was just for the Little Texas concert at the county fair! My get-up was technically faux cowgirl…you know, trendy “booties” instead of real ropers, but I never went as far as having a belt buckle or Wrangler jeans. I did have a few radio presets dedicated to the local country music station at age 18, but all of it faded away just as quickly as it set in. Yet somehow, I managed to fall (and stay) in love with George Strait. And back in the day, I would have donned all that western wear, moved to Texas and developed a real southern drawl just for him. I mean, if I was ever going to go for a cowboy…it would have had to have been him—because if you’re gonna love a cowboy, why not love one who can sing? While clearing the kitchen table and belting out a little George, the thought occurred to me—almost every song reminds me of a place in time. Memories, days gone by, people who I know and have known. It appears that several of his tunes have served as the soundtrack to many different seasons in my life. Crushes, first love, long drives, adventure, good times and bad. Right or Wrong, Fool Hearted Memory, A Fire I Can’t Put Out…seem to speak to times of young love and the intense feelings that often come with those first break ups and let downs. It was like George was the only one in the world who knew exactly how I felt! Then there were catchy tunes like The Fireman that remind me of KU and driving home with my roommate Sara in her hot, little red car. You Can’t Make a Heart Love Somebody, Easy Come, Easy Go, and Write This Down mark times where I learned important lessons about moving on and trusting God’s plan in both life and relationships. Twangy feel good music like Am I Blue always make me want to dance the day away. And two of my favorites–The Chair and All My Ex’s Live in Texas remind me of my parents–especially my dad’s band and concerts in the park downtown on summer evenings. Unlike my other music phases, my George fanaticism began at a young age. I remember hearing George in the background while I learned to sew at my Grandma’s house. His songs seemed to play non-stop the first time I visited the great state of Texas (not to mention every time that I’ve ever stepped foot there.) George rode shot-gun with my best friend, Amy and I on our great Tulia, TX adventure in college. Later, his music again played on the radio appropriately setting the stage for a trip to Nashville. And it was George who traveled with me when I moved from Kansas to California. He was my cowboy companion as I cruised the interstate…thank goodness for a cassette player with auto-reverse! I laughed out loud while listening to Ocean Front Property in Arizona…scoping the horizon for his imaginary piece of real estate as I neared Phoenix. One song after another served as the backdrop to beautiful countryside and endless highway. And it was Heartland that later satisfied my soul when I found myself homesick for family and friends back in the Midwest. Other songs like Carrying Your Love with Me and I Cross My Heart remind me of true love, family values, and faith in God. I know I’m not the only one with memories like these. And it’s been equally as fun to introduce my children to George’s music. His CD 50 Number Ones was on our vacation playlist as we traveled through Denver, Cheyenne, Salt Lake City, Lake Tahoe and finally into the San Francisco Bay area a few summers ago. They claim not to like him…but one glance in the rear view mirror and it’s hard not to notice them singing along. Just tonight my son belted out three songs in a row as he wandered into the kitchen asking aloud, “How do I know every single word?” My daughter rolls her eyes when I bust out a little George in the car on the way home from basketball games. Yet, I wouldn’t be surprised if someday George Strait makes his way onto their playlists. I imagine them sheepishly trying explain to their friends that these songs remind them of their mom and childhood! Better yet, I’d love to hear their take on the little ditty I call my “ultimate George Strait life song”—Ace in the Hole. They frequently give me the oddest looks when I tell them that there’s a life lesson in that song that will serve them well…if they just pay attention. Sure, Mom…sure. While my radio presets today run the gamut from News Talk and Christian contemporary to Pop and Top 40, modern technology makes it easy enough to find George when and wherever the mood strikes. I don’t have any crazy aspirations of ever meeting George Strait. In fact, it’s probably better this way. I’ve been lucky enough to see him in concert twice and I’m good with that. As for me, our occasional kitchen-after-dinner meet-ups will continue to suffice, especially since they’ve been going on for years. Besides…who would two-step with the broom if George and I didn’t have these now and again country rendezvous? This entry was posted in Friends, Fun, Home, Nonsense and tagged children, country music, friendship, fun, George Strait, home, kitchen, Life, music, travel by hymningandhaing. Bookmark the permalink.